It is even possible to have 3 of these gems add up an total 21+ str. than using http://wotlk.wowhead.com/?item=40111 ! It looks like the Death Star if Darth Vader was one of the Village People. For example, you can put 3 of these strength gems into your DPS gear, then put 3 stamina gems into your tank gear (assuming none of these items overlap). Anyone know if these count toward the requirement for meta gems? I.E. could I use all red/yellow gems, and 3 of these to activate Chaotic Skyflare Diamond? Can anyone confirm that socketing these does not cause your equipment to become soulbound? For example, could I socket this in the new http://www.wowhead.com/?item=42645, and then trade it off to a friend? I only ask because every other profession has items that specifically say they can only be used by the profession (i.e. http://www.wowhead.com/?spell=57683), and it seems odd that Jewelcrafting would break that trend. Edit: Having tested this for myself, socketing the BoP gems does NOT cause the item to be soulbound. However, like other posters have mentioned, it adds a "Jewelcrafting (375)" requirement to the socket. This requirement cannot be seen by me, for some reason, but was seen by my friend when I traded him the item. 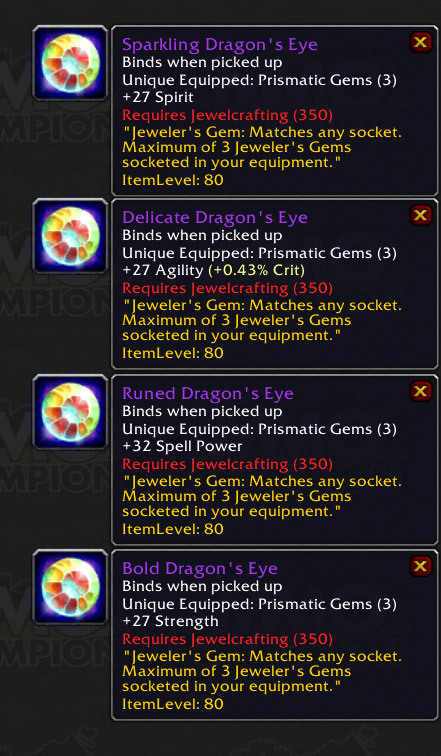 So an item socketed with a Dragon's Eye would only be useful to another Jewelcrafter, who could easily make his own gems. Putting this into a BoE *will* make it BoP. You can not transfer these off to anyone else. It requires 375 jewelcrafting to work, if you don't have that the gem will be inactive. Are those gems only for Jewelcrafters? So, not only do you have to make it, but you can't drop jewelcrafting and still use these. These little things make JC the best profession for Fury warriors (and probably ret pals und dmg dks too) who seek to maximize dmg output. Blacksmithing, which comes in second, would allow you to add two additional and exclusive sockets in your hand and wrist slots which equal 32 str (filled with Bold Scarlet Ruby). - Every warrior will use Chaotic Skyflate Meta requiring atleast 2 blue gems which means u would have to put in 2 Sovereign Twilight Opal (8 str 12 stam) in ur gear and would loose 16 str compared to 2 Bold Scarlet Rubies. This isnt the case with 2 Dragoneyes. So with the meta they add another 16 str. - Warrior Tier Chest and Legs as well as other very good plate items (Obsidian Greathelm for example) have blue sockets with quite appealing socketboni such as str or hit rating. When putting Dragoneyes in those blue sockets u get the bonus for free without suffering a stat loose on the purple gem u would have to put in otherwise. With the 3 named items this would be another 14 str and 6 hit rating but that obviosly varies depending on the items in use. Other professions are quite behind. Leatherworkers exclusive wrist "enchants" would give 114 ap. Compared to the 50 ap available for everyone this is a 64 ap increase. Inscriptoners exclusive shoulder "enchants" grant 104 ap and 15 crit rating. Compared to the sons of hodir enchants (40/15) its also 64 ap more. Both are clearly inferior to 32 str from BS because of blessing of kings. If Blizzards is going to implement epic gems (like in BC) in the near future BS would get a little boost with their 2 exclusive sockets and JC will get a little weaker in comparison (as the gap between epic gems und dragoneyes will likely be smaller than the gap between blue gems and dragoneyes) but I think it safe to asume that both professions in combination will remain the top stat contributers for fury warriors. So can i socket these at 350 jc like the guy above was saying or 370 jc? can anyone confirm? The icon is so beautiful, everytime I look at it I fall in love with it again and again and again..
and a taste explosion in the middle of rainbow cream! Seems to me like you can socket them at 350, but they require 370 skill to make which seems rather pointless.. unless they're thinking of the people who level JCing to 370, make these gems, drop it, and re-get it to level 350 to use these gems. With the upcoming JC "nerf" This and all other gems arent anymore prismatic... their such like their original Blue quality gems" So Bold Dragenseyer = Red gem with 27 Strengh. Why is the above down rated? The content of it is totally correct. As of patch 3.2 these are no longer prismatic. Excep they're still way better than regular epic gems, which pwnz. Does anyone know if the jewelcrafter's chance to cut perfect gems can proc on these unique equiped gems? If so, what's the strength bonus on one of those? So, you could stick 3 of these gems in shadowmourne? Are these useable on weapons as well as armor? Could you socket three of these on say Shawdowmourne if you didn't have any other specialty gems used yet? You bet! Socket on a Weapon is a good choice.